What to Do For Valentine's Day in Paris? If you're lucky enough to be planning Valentine's Day in Paris with someone you love, you're not likely to come away disappointed. That is, on at least one important condition: you have to keep your eyes and mind open to the capital's particular magic, and suspend some of your expectations for things to go a "certain" way. After all, perfection is the enemy of the good, as the old maxim goes. The city of light, so long associated with romance of a rather canned and cliché variety, has so much more in store than the movies show. There's an authentic sort of romance here: one that's likely to wash over you at unexpected moments, perhaps when you're strolling with your sweetheart down a quiet, unassuming alley, or admiring a painting together at a little-known but magnificent museum. But even if Paris seemingly has romantic mojo built into its DNA, planning ahead for your special day is essential, as couples naturally flock here to celebrate together on February 14th. With that in mind, here are some ideas and tips to help you have a truly memorable Valentine's Day in the capital. If you're hoping to book a table for a special Valentine's Day dinner in the city of light, be aware of the fact that you're far from alone. There's likely to be stiff competition for a table at the capital's most-coveted restaurants, and you may have to be a bit flexible and creative to find the perfect spot for a romantic tete a tete. That said, the capital is one of the world's great gastronomic centers, so you're spoiled for choice. Take a look at our guide to some of the most romantic restaurants in Paris, as well as this piece on the finest gourmet tables in the capital. And if you're on a tighter budget, not to worry — there are plenty of ways to enjoy a lovely meal together, even if it doesn't cost a small fortune. French creperies can offer a surprisingly romantic ambience, and these excellent budget-friendly restaurants might also do the trick. You might also want to peruse our list of the best wine bars in Paris: many offer simple cheese and charcuterie plates or tapas-style dishes that can perfectly complement a good glass of red or white, at a more modest budget. What could be more authentically French? And we think authenticity is romantic. One of the most popular activities for couples on Valentine's Day? Taking a romantic dinner cruise on the Seine River. It's obviously and indisputably appealing: you can take in some of Paris' most-iconic sights and attractions while you enjoy a full menu of French or continental-style dishes, served with wine or even champagne. Soft candlelight and even live music are common features on many cruises. As you drift under beautiful bridges and pass by sights such as Notre-Dame Cathedral and the Louvre, enjoy the soft play of city light reflecting on the water, and get a glimpse of the Eiffel Tower looming in near or far-distance. You can also opt for a joint package that includes dinner for two followed by a traditional cabaret show — a nice way to plan the entire evening. Check out Discount Paris for current deals. Even if you don't want to have dinner onboard, you can always opt for a romantic sightseeing cruise of Paris. It can be an incredibly soothing, picturesque way to see the city, perhaps snuggled together for warmth on the top deck. Since Valentine's Day falls in February, do make sure to bring scarves, gloves and jackets! The wind chill off the river can be a bit daunting — but some might find the wintery air invigorating. Sure, it's a bit on the cliché side, but everyone should see at least one traditional Parisian cabaret in their lifetime. Elaborate costumes, traditional French show music and champagne: this can certainly make for a fun and memorable night, especially if you'd like to get a taste of what all the fuss is about. From the Moulin Rouge to the Lido and lesser-known, village-style cabarets in hilly Montmartre and gritty Belleville, there are options for all tastes. 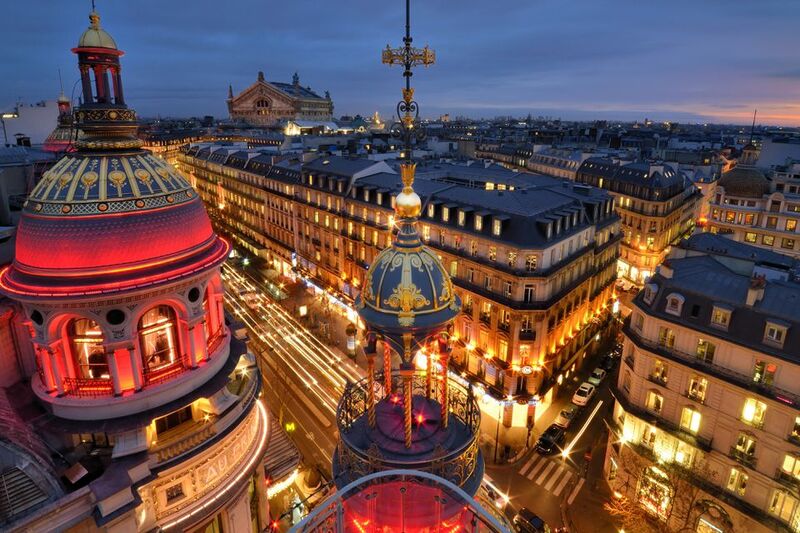 See our complete guide to the best traditional cabarets in Paris and consider reserving an evening at one of those iconic addresses. A bit more in the mood for classical music, a jazz show or opera? Assuming you reserve at least a couple of months in advance, you should be able to find something to suit your mutual tastes. See our complete guide for music lovers in Paris for the best venues and options. Chocolate and Valentine's Day are pretty inseparable in most people's minds, right? While we don't think you need an excuse to explore the finest chocolate shops and makers in Paris, you get a free pass on February 14th or the days around it. If you'd prefer a guided chocolate tour, there are plenty these days. We especially recommend the ones offered by Paris by Mouth. For some couples, the idea of nursing creative cocktails in a "speakeasy"-style bar somewhere in Paris sounds like the height of romance. Luckily, this is on-trend: several charming little bars have popped up around the city in recent years, many located behind "secret" doors, or at the back of cheap-n-cheerful Italian pizza joints. Here, the city's most creative mixologists serve up cocktails that are giving the traditional Parisian brasserie (and even fancy hotels) a run for their money. Head out together for a drink or two at one of the best-hidden bars in Paris, order a gorgeous tipple, and sink back into a comfy sofa or armchair together, taking in the heavy hum of conversation and music. We think there's something classically romantic about an old-school cinema. Not the kind where your neighbor loudly munches his or her way through a giant tub of popcorn, but you're fine with it because the action-movie soundtrack is loud enough to break the sound barrier. No — we're talking about places with plush red seats that could probably use a refurbish, and theaters with old art-deco lamps and ornate ceiling moldings. The best movie theatres in the capital play retrospectives on some of the world's best directors and actors, or quirky modern movies that win over audiences everywhere. Look through our list of the best cinemas in Paris, and think about adding an old movie at one of these to your romantic itinerary. Many theatres show English-language films in "VO" (Original version), with French subtitles. If you don't speak the local language, steer clear of those showing in "VF" (French version). This site sometimes lists current showings of English-language flicks in the capital, which can be handy. If you're both in to traditional Valentine's Day gifts but prefer to have input from your sweetheart before you take the plunge, Paris is the perfect place to shop for unique and elegant perfumes. It's one of the world capitals of unique and even entirely personalized (bespoke) fragrances, and there are plenty of beautiful boutiques where staff are more than happy to help you choose (or blend) the scent that really speaks to you. Some of the best scentmakers, including Diptyque and Serge Lutens, are masters at producing excellent unisex scents, too. Who says you have to find a boring scent that automatically says "man" or "woman?" Let your imagination and olfactory joy guide you in choosing the right one. You can even take an excursion together to the Fragonard Perfume Museum, a free collection that explores the history of scent-making. After touring the collections, visitors can peruse the shop or even take part in perfume-making workshops. Romantic comedies set in Paris almost inevitably include a scene in which two star-crossed lovers finally reunite and enjoy an explosive kiss, as cameras pan out to panoramic shots of the city (and the Eiffel Tower, of course). There's good reason for this: the soaring heights convey a sense of romance like little else. Get up there with your sweetheart to enjoy breathtaking panoramic views of Paris. Whether from La Tour Eiffel, the rooftop at the Centre Pompidou, Montparnasse, Montmartre or Notre Dame, there are plenty of spots where you can enjoy sweeping perspectives (sometimes for free). Also check out our guide to the best rooftop bars in Paris. Many, including Le Perchoir, offer some pretty stunning views. Even better? Some serve nibbles and even dinner, offering a complete package for the evening. If you both enjoy afternoon tea, why not hop over to the recently-renovated Ritz Hotel and enjoy their utterly decadent, beautifully presented afternoon tea? Enjoy finger sandwiches, rich French pastries and cakes, authentic French teas and a flute of champagne with your chéri/e, basking in the iconic site. And while it's not inexpensive, it's less expensive than dinner for two at a restaurant of a comparable standing and reputation. You can find more information on tea at the iconic hotel here, as well as make reservations. Make sure to book well in advance: this is an incredibly popular afternoon tea. Interested in having a romantic gourmet tea for two somewhere else in the city? See our complete guide to where to find the best afternoon tea in the capital. We understand that most couples have to work within a modest or tight budget to afford a romantic getaway to Paris. How to ensure your trip is unforgettable, but also doesn't break the bank? There are a few sites we recommend you scour a few months in advance for special romantic deals. If you're traveling within Europe, for example, Easyjet frequently offers discounted Valentine's Day flights to Paris. If you're coming from North America, check the deals page at Air France. Meanwhile, local sites like this one and this one generally offer special Valentine's Day deals on attractions such as dinner cruises, cabaret shows and rooftop dining.